Two things to keep in mind as you make this recipe - first, this makes a very full pot. Make sure that your particular ingredients come only to the fill line, and not above. Second, make sure that you natural pressure release after cooking. Let the cooker sit on warm for at least 15 minutes, because this is a huge pot of super hot liquid and it needs to settle down in there before you release the steam. 1 30 oz. jar sauerkraut or frozen, home made, etc. Put the sauerkraut in the bottom of the liner of the Instant Pot. Then add both cans of the cranberry products. Dump in the two jars of chili sauce, then fill the jars with water and shake well. Add both jars of water to the pot. 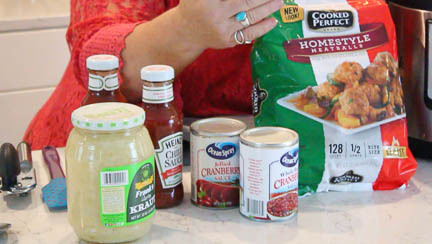 Stir everything together, breaking up the cranberry sauces as you go. It does not have to be perfectly mixed. Add the meatballs, and push them down into the mix so they are mostly submerged. Lock and seal your lid, and make sure your toggle is in the sealing position. Set manual/pressure cook for 9 minutes. Allow for a 15 minute natural pressure release. This is a huge pot of hot liquid and NPR is better for most meat recipes, too. My mom, Pat, has been making this recipe for meatballs for a very long time. It HAS to be one of her MOST requested recipes! She usually makes all the meatballs from scratch, and, quite honestly, the recipe IS better using a home made meatball. But, there are often times when a cook needs a fast, easy and economical recipe that will feed a bunch of people and this recipe, cooked in an Instant Pot, is just such a resource. Mom also typically makes this in a huge slow cooker, which does lend a certain depth of flavor. However, using an electric pressure cooker still makes a delicious and easy alternative. Many old family recipes can be converted to pressure cooking with just a little trial and error. Two things to keep in mind as you make this recipe – first, this makes a very full pot. Make sure that your particular ingredients come only to the fill line, and not above. Second, make sure that you natural pressure release after cooking. Let the cooker sit on warm for at least 15 minutes, because this is a huge pot of super hot liquid and it needs to settle down in there before you release the steam. The IP will keep them warm as long as you leave the warm setting on, and so they can be served right from the Instant Pot, making this a great one pot recipe that requires very little clean up! People will come back again and again for this dish, like little piggies to the trough! 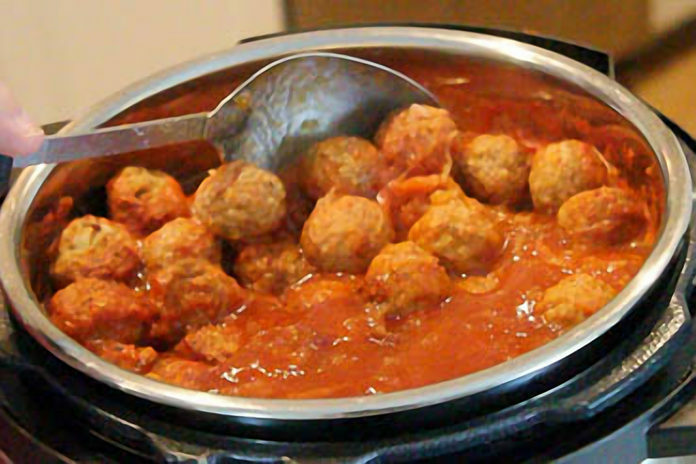 This recipe does make a LOT of meatballs, so it is perfect for New Year’s Eve, a Super Bowl party, or any big gathering. The meatballs will also freeze well, so IF you have any leftovers, they can be stored in the fridge for up to a week and then in the freezer for up to 6 months. Next articleFrustrated With Your Instant Pot? Just Relax… And Go Sit On Your Front Porch.